Diablo III: The Rise of the Necromancer DLC Coming June 2017 | Nerd Much? 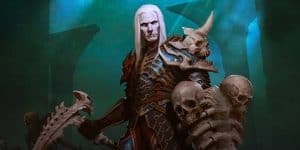 Blizzard has announced today that the DLC for Diablo III titled The Rise of the Necromancer is to be released June 27, 2017 on the PS4, Xbox One, and PC. This pack adds the necromancer class to the main game. Necromancers first appeared in Diablo II, as the Priests of Rathma, and use power drawn from blood and bone to resurrect dead enemies or explode them. Whatever your heart desires. There is also a digital-only Eternal Collection that newcomers can pick up. This collection includes The Rise of the Necromancer, Diablo III, and the Reaper of Souls DLC for the PS4 and Xbox One, but not the PC. Such a collection would be great for anyone who hasn’t experienced the lovely couch co-op gameplay that Diablo provides. The Rise of the Necromancer pack can be bought for the price of $14.99 USD. The Diablo III: Eternal Collection is available to PlayStation Plus members and Xbox Live Gold members for a limited time at a special introductory price of approximately $37.99 USD.